Yusaku Maezawa, the 40-year-old founder of online clothing retailer Zozotown, continued his art shopping spree on Wednesday, helping Sotheby’s reach $242.2 million in sales at its contemporary art auction even as the art market continues to contract. Maezawa said he is building a private museum outside Tokyo. 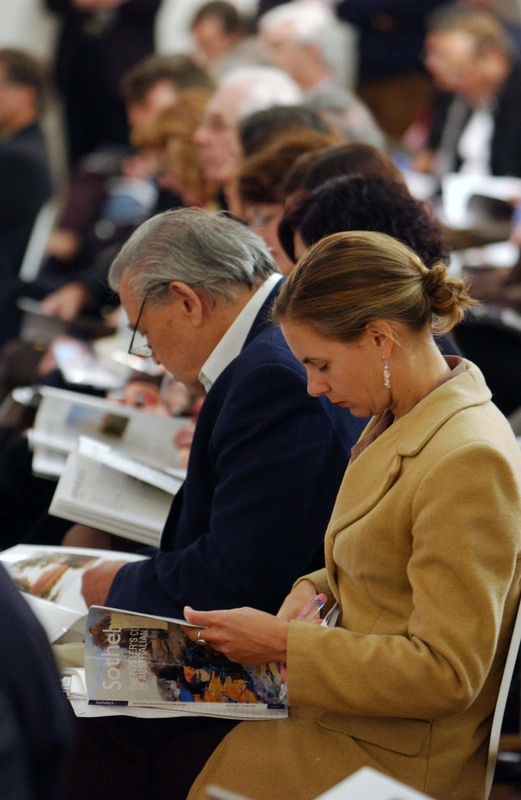 Sotheby’s evening sale in New York was within the target range of $201.4 million to $257.5 million. The result represented a 36 percent decline from a similar event a year ago. But it was an improvement over the auction house’s Impressionist and modern art sale on May 9, when a third of the lots went unsold. Of the 44 lots offered on Wednesday, only two failed to sell. The auction showed that, while many sellers have decided to wait out the economic volatility, plenty of buyers jumped in. In addition to Maezawa, Los Angeles billionaire Eli Broad snapped up Sam Francis’ colorful abstract “Summer #1” for $11.8 million, a record for the artist at auction. The price was slightly below its high estimate of $12 million. Broad, who built some of his $2 billion art collection during the art market’s down cycles, pursued Francis’ 8-foot-tall by 6-foot-wide painting against other bidders. The auction began with a flurry of bids for fashionable artist Adrian Ghenie’s “Self-Portrait as Vincent Van Gogh.” Estimated at $200,000 to $300,000, the somber painting soared to $2.6 million. Maezawa, bidding through Sotheby’s contemporary art specialist Yuki Terase, outlasted at least five other hopefuls. A few minutes later he chased Christopher Wool’s white canvas spelling out “Chameleon” in chunky black letters. The work fetched $13.9 million, falling just short of the low estimate of $14 million. 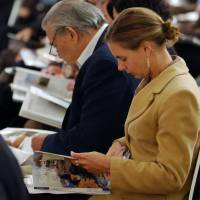 These two purchases brought Maezawa’s two-day tally to $98 million. At Christie’s on Tuesday, he dropped $81.4 million on five artworks, including $57.3 million for a Jean-Michel Basquiat painting. His purchases at Christie’s accounted for a quarter of the auction’s tally. “Chameleon” was one of four lots at Sotheby’s consigned by Daniel Sundheim, the chief investment officer at Viking Global Investors. They were part of a swap to pay for a $70.5 million Cy Twombly painting that he bought in November. Sotheby’s offered Sundheim a guarantee for seven swapped works, three of which went up for sale in London in February. Sotheby’s outsourced some of the risk on Wednesday by locking in bidders for the four works. Andy Warhol’s 1986 self-portrait in a fright wig fetched $7.7 million, just surpassing the low estimate. Twombly’s “Untitled [Bachus 1st Version V],” depicting messy red loops, fetched $15.4 million, falling short of its $20 million low estimate. Basquiat’s painting “Onion Gum” fetched $6.6 million. Sundheim paid $7.4 million for the work in 2012 at Sotheby’s, when it was sold by newsprint magnate Peter Brant. The evening’s top lot, Cy Twombly’s “Untitled 1968 (New York City),” showing blue chalk-like loops on a gray surface evoking a blackboard, sold for $36.6 million against an estimate of more than $40 million. Works that were new to the market or had been in significant collections did well. Alexander Calder’s standing mobile, which was given as a gift by the artist to Alfred H. Barr Jr., the founding director of the Museum of Modern Art, fetched $8.3 million, more than doubling the high estimate of $4 million. Chased by five bidders, Francis Bacon’s 1970 “Two Studies for a Self-Portrait” fetched $34.9 million, surpassing the high estimate of $30 million. The work remained in the same private collection for 46 years. Despite strong individual results this week, each evening sale totaled a fraction of its value from a year ago, when Christie’s, Sotheby’s and Phillips tallied $2.7 billion in sales. The last evening sale in this event is Thursday at Christie’s.